In general I’d say we all, on the whole, try to be pretty good most of the time. We try to eat more greens, drink a little less, get some exercise, be nice to one another, avoid road rage. But, seeing that we are only human, sometimes all of that good just goes out the window and we choose to be bad. Very bad. Like taking the incredible edible egg and creating a truly sinful meal with it. Spaghetti carbonara. Creamy, decadent and most definitely not diet friendly. I’ve tried a few different versions but this classic preparation is my favorite. Feel free to be generous with the parm, I mean you’re already going all out, right? Put a big pot of water on for the pasta. While it’s coming to a boil put a little olive oil in a large skillet (large enough to fit all the pasta you’re cookin’ up) and cook the pancetta until it’s crisp. Pour the wine in with the pancetta to de-glaze the pan and let it cook down until it’s a syrupy consistency (a few minutes). Place pan off the heat. 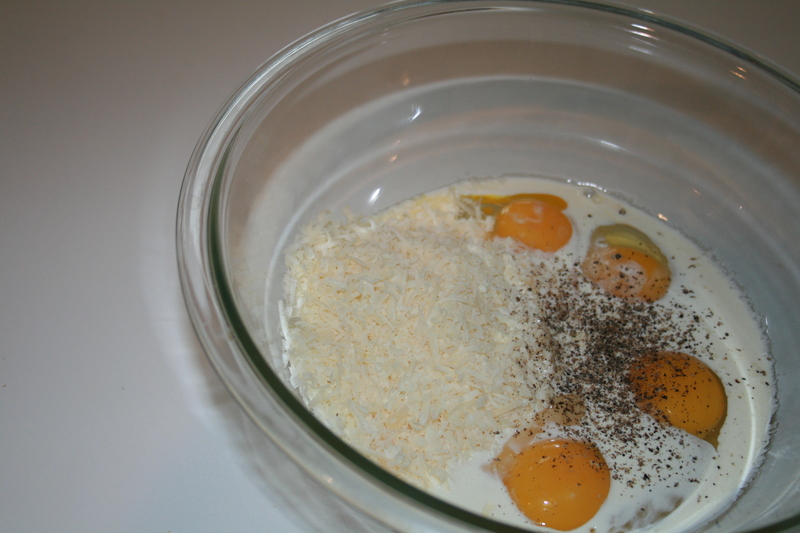 Meanwhile combine the eggs, parmesan, cream and pepper in a bowl and whisk together. 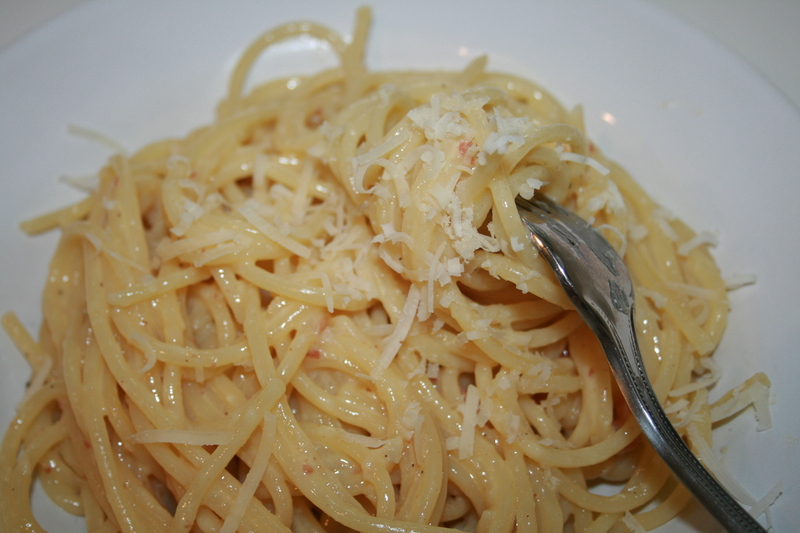 Once the spaghetti is cooked just to al dente strain and place it in with the pancetta mixture and combine over heat. Once it’s good and mixed, take the pan off the heat and toss with the egg mixture. Save some of the pasta water because the mixture may need to be thinned a bit. Add a bit more pepper, a healthy amount of nutmeg and a little more parm and dig in. Sure, this dish may be a little naughty but sometimes being bad can be oh so tasty. This entry was posted in Eggs, Nutmeg and tagged cream, eggs, nutmeg, pepper, spaghetti carbonara. Bookmark the permalink. Wow… I had Shake Shack for lunch and yet reading through this makes me hungry… awesome job Ames! !